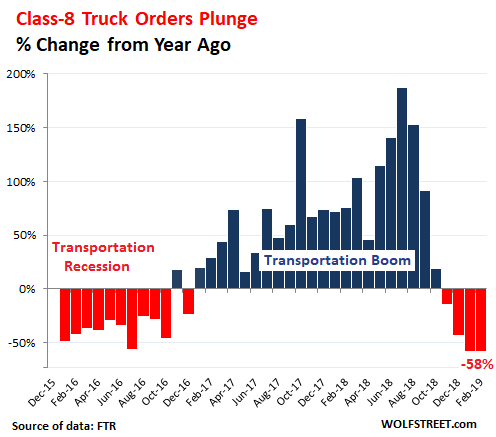 Orders for Class-8 trucks – made by Daimler (Freightliner, Western Star), Paccar (Peterbuilt, Kenworth), Navistar International, and Volvo Group (Mack Trucks, Volvo Trucks) – plunged 58% in February compared to February last year, to 16,700 orders, according to FTR Transportation Intelligence after they’d already plunged 58% year-over-year in January and 43% in December. The business is infamously cyclical, with regular booms that lead to over-ordering and then overcapacity, followed by busts that then sort it all out again. The industry is also seasonal, so we can use year-over-year comparisons to eliminate most of the effects of seasonality. “The weaker orders mean that backlogs will tumble for the second straight month, but they remain at historically high levels,” FTR says. These backlogs will keep plants running at capacity until mid-2019, and some truck makers “are booked solid for 2019 with limited sales slots open for the remainder of the year,” according to FTR. 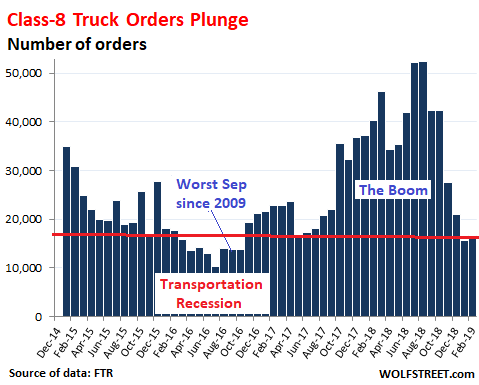 So truck makers are going to stay busy for a while, and fleets are getting their trucks, and trucking capacity is expanding and will continue to expand, even as orders get slashed. This rising capacity finally provides some relief to shippers, such as retailers or industrial companies that need to ship their products to their customers. The transportation recession – as tough as it was on truckers, railroads, and truck and component makers – was nirvana for shippers: lower freight rates and no bottlenecks. But in 2018, they’d been complaining about soaring freight rates and shipping delays, and any loosening of those shipping conditions is a godsend to them. 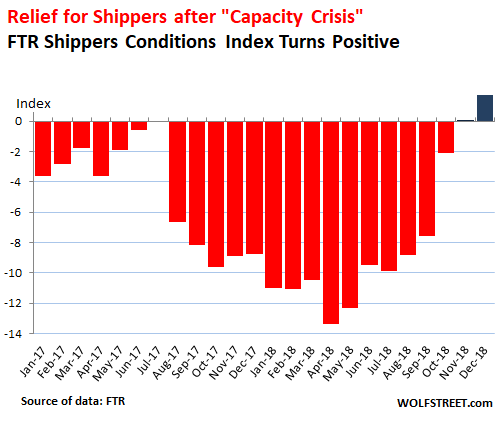 Now, shippers are getting a break as the trucking sector is cooling off, according to FTR’s Shippers Conditions Index. The index, which gauges the temperature of the freight market — including trucking, rail, and intermodal — from the shippers’ point of view, combines freight demand, freight rates, fleet capacity, and fuel price into an index value. “Stable fuel prices, a turn in rail service levels, and loosening truck capacity have combined to create a favorable environment for shippers seeking to move freight,” said FTR’s VIP of rail and intermodal, Todd Tranausky. Now there’s the same problem on the horizon that contributed to the transportation recession of 2015 and 2016: Inventories have been piling up. In December, latest data available, wholesale inventories rose 7.3% from December 2017, to a record $662 billion, even as sales have begun to stall. As companies react by whittling down their orders, shipments decline.